Although I made a few little errors along the way I am really pleased with the results. As the days (months!) passed my technique improved and I’m hoping KISS will turn out a bit neater! I also found it a very relaxing craft and once I got in "the zone" I could stitch away for ages - very therapeutic! One down and one to go! Next to start work can’t wait to get the KISS tapestry finished too…. I haven’t decided what to do with the tapestries once they are both finished. Emily shows them made into cushions on her website but I think they might get damaged too quickly in my flat (I have a propensity for throwing red wine around the place!). I am thinking of getting them framed and putting them above the doors as they are just the right size for that. Anyway, if it takes me as long to complete KISS as it did to do HUG I have a few more months to worry about it yet….! Absolutely beautiful! I know how much work goes into the stitching. That's needlepoint? I love it! What incredible stitching!! These are beautiful!! You must be so pleased after SOOOO many hours of work! Did you get the KISS one made? 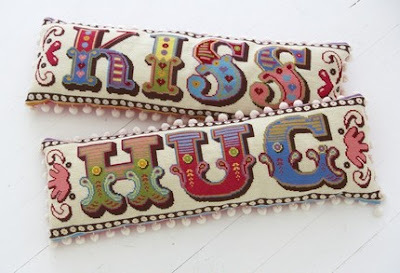 Yep, the KISS one is done too - I finished it last summer. I just need to make them both into cushions now. Must get on with it! !